Sometimes, HeavyHands users get stuck in a rut…the standard “pump and walk” exercise is usually the first one we learn and becomes the one we “default” to. Though Dr. Schwartz wrote two books highlighting many different techniques for obtaining the variety needed to keep HeavyHands interesting mentally while providing a full body workout, sometimes other variations may be desirable. As I was out on an hour and a half walk recently, I remembered some exercises I’d read about in David Bolton’s The Lost Secret To A Great Body. Walking along I found myself going through the parts of this workout that I could remember and it kept my heart rate up nicely while being a bit of “active recovery” during this lengthy walk. It enabled me to exercise using muscles relatively untouched by the standard “pump and walk” and which, by that time, were getting fatigued. As I was reflecting on it later, though Dr. Schwartz wasn’t interested in being as well muscled as Eugene Sandow who was arguably the first “bodybuilder”, Schwartz’ physique was along Sandow’s “classic” lines. Though as a physician Schwartz didn’t care about “bodybuilding” for its own sake, the type of “useful” muscle and proportion Schwartz considered the ideal was something he shared with Sandow in many ways. So what is Bolton’s book about? 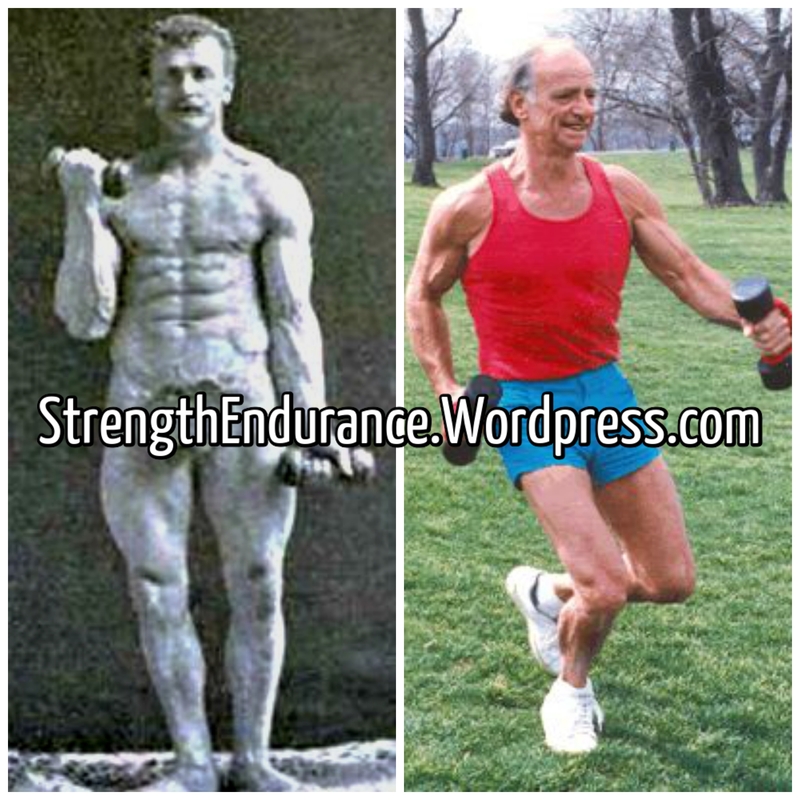 David Bolton in his research into the use of light dumbbells (3 to 5 pounds) found that Sandow, his instructor, and most of the old time advocates of dumbbell training suggested virtually the same routine and considered that routine fundamental to overall fitness. Even the ones not selling body building courses by mail (Bobby Pandour) ascribed to the same system of training basically. 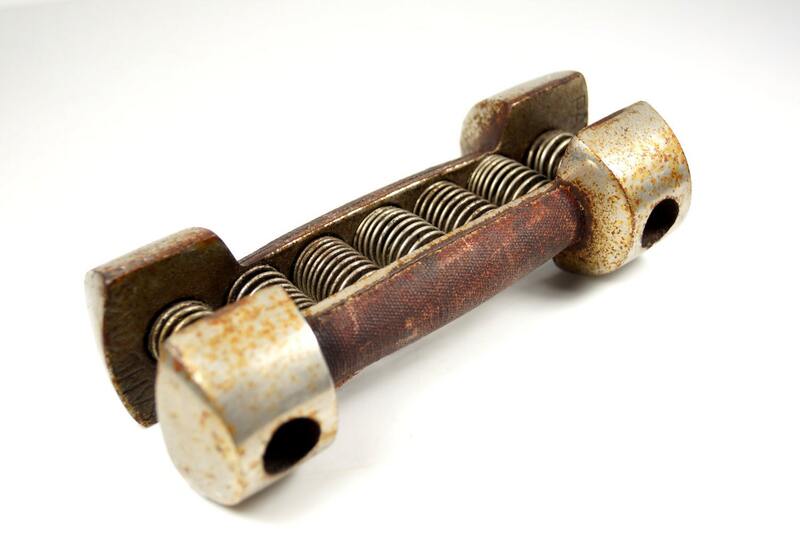 Men at their peak like Sandow reportedly used 7 pound dumbbells (Pandour used 10 pound bells), but so that students would understand the mental focus required, Sandow produced a special dumbbell/gripper that demanded constant tension! HeavyHands users will find it interesting that Dr. Schwartz – while using heavier weights for some specific exercises like Double Ski Poling – tended to max out with walking weights in the 8 pound range and often used lighter weights for faster movements and more “work”. He too derived long term benefits from weights easily dismissed as “too light” by many. His understanding of exercise was much different than Bolton’s, but those differences aside, this article mention’s Bolton’s exercises for the variety they can add to a HeavyHands routine. As our understanding of “progressive resistance” increased, these claims to benefit from insanely light weights seemed preposterous, and things like Sandow’s strength and muscularity were attributed exclusively to “secret” training he never talked about. As Bolton studied the matter, he concluded people had missed something… the mental action and tension that attends the exercise and gets effects that are not dependent solely on the weight. That seemed to jibe with a McMaster’s University study mentioned toward the end of Bolton’s book. I understood this better after I’d been swinging the HeavyHands already and was warmed up first. I could “feel” the movements better than simply doing them “cold”. One thing that modern fitness folks are starting to comprehend as they revisit some of the “old ways” is the impact of muscle control and focus in the use of light weights (or simply tensing muscles alone) and how that relates to strength and endurance performance… ask Pavel sometime as he lectures on Maxick, a famous muscle control artist and strongman. Of course Sandow and others used the qualities developed through their dumbbell work to attend to their strength feats later… in Sandow’s case literally later in the evening during his performances! The dumbbells were the base workout. So what are some of the exercises in Bolton’s book? Of course not all these exercises are things you’re going to do on a HeavyHands outing… and they’re not “panaerobic” unless you’re moving at the same time… and some – like shoulder shrugs – were always mentioned by Dr. Schwartz. Still Bolton’s book is an interesting read, provides thoughts on variations for HeavyHands training at the very least, and reminds us that while many people may underestimate the value of training with light weights (a common criticism of HeavyHands), they may not have the last word on the subject if the weights are being used correctly! I’ve built more muscle on my upper body using a $30 Ivanko gripper than I ever did using 600+lbs of weights. So tell us about how that has worked for you? Its proven the amount of growth stimulation required is for highly sensitive individuals like me very, very low.